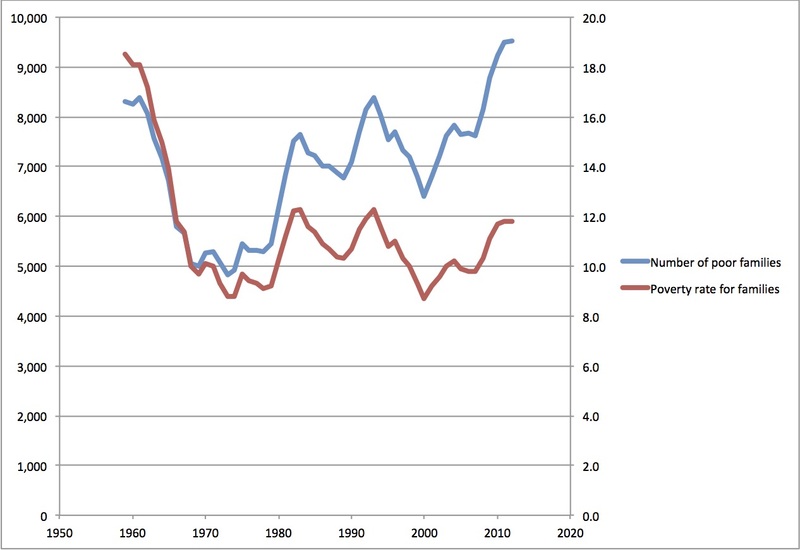 Both the number and the percentage of families in poverty dropped sharply during the 1960s when the “War on Poverty” was being waged actively, and remained near their all-time lows through the Nixon and Carter years until 1979, when the Volcker recession hit, followed by the election of Ronald Reagan. These events can reasonably be said to mark the point at which the government unequivocally changed sides. The number of households in poverty has risen steadily since then and is now higher than in 1959, the year for which the poverty level was first defined by Mollie Orshansky. The poverty rate has remained consistently higher than in the 1970s, except for a brief deep at the peak of the late-1990s boom. A quick note on the data: Unlike most other countries, the US uses an absolute poverty line, rather than a measure set relative to median income. Orshansky estimated a food budget that was adequate but austere by the standards of 1960, then multiplied the cost by 3 on the basis that the food share of a poor families budget should be 1/3. It’s been adjusted for inflation since then, but not increased in real terms. It might be argued that the CPI overstates inflation somewhat. But much the same point applies to measures of GDP per person which has increased dramatically over the 35 years since the US government stopped fighting poverty and started fighting the poor. The measure includes cash transfers, but not some non-cash benefits, notably including the Supplemental Nutrition Assistance Program (food stamps) the Earned Income Tax Credit introduced in 1975 . The result is to understate the progress made on poverty reduction since the 1960s, but not to change the basic story. Food stamps have been under attack from the right since the early years of the Reagan Administration. EITC had bipartisan support until the 1990s, but is also now under attack. This paper Fox et al (2014) has a slightly more sanguine view of trends in US poverty rates. Using data from the Consumer Expenditure Survey and the March Current Population Survey, we calculate historical poverty estimates based on the new Supplemental Poverty Measure (SPM) from 1967 to 2012. During this period, poverty as officially measured has stagnated. However, the official poverty measure (OPM) does not account for the effect of near-cash transfers on the financial resources available to families, an important omission since such transfers have become an increasingly important part of government anti-poverty policy. Applying the SPM, which does count such transfers, we find that historical trends in poverty have been more favorable than the OPM suggests and that government policies have played an important and growing role in reducing poverty — a role that is not evident when the OPM is used to assess poverty. We also find that government programs have played a particularly important role in alleviating child poverty and deep poverty, especially during economic downturns. @Bruce Bradbury There is a heap of evidence based studies appearing in peer reviewed journals into the links of poverty with diabetes, obesity, crime etc etc. AFAIK Heritage Foundation is an opinion generator. Another measure of USA poverty is food stamps. Surely food stamps should just go to poor families and individuals. Food inflation has been lower than the general inflation for a couple of centuries now (not true year by year but over decades it is). This agricultural revolution thing. There’s no actual evidence of that. Quite the contrary. At heart I am making one specific claim. JQ, in the original post, states that the transfers of goods and services, which are not included in the calculation of the poverty rate, make no difference to the basic story. My claim is that this is untrue. Those transfers are of such size and value that they significantly change the basic story. And that’s it, that’s my point. As I specifically point out, that estimation of poverty is *before* those transfers of goods and services. That’s the very point being made. On that basis poverty before alleviation is 20%. Rather the point being made is that we might be interested in what is the poverty level after alleviation attempts? After all, the poverty rate in Sweden (and other places) would look pretty grim if we measured it before the influence of redistributive transfers, wouldn’t it? It’s not really a measure of poverty that, it’s a measure of inequality. Useful and important no doubt, but they’re not quite the same thing. Poverty with the alleviation you cite, remains poverty. Placing a band-aid over an ulcer still leaves the ulcer. We should not forget that the US “hides” some of its poverty by putting poor people in a situation where they have very few options, so consequently some of them resort to crime (including drug related crime) to make ends meet. Then they end up in prison. The last time I checked the figures, almost 1% of the US population was in prison. What an odd country. 14.3 percent (17.5 million) of U.S. households were food insecure at some time during 2013. Again, what an odd country. That would be a plausible explanation of people (rich or poor) spending a lower proportion of their budgets on food than was formerly the case, but I don’t see how it affects the incidence of poverty one way or the other. If food has become cheaper relative to other things, then mathematically equally other things have become more expensive relative to food. You could say that people don’t need to spend as much on food and so are free to spend more on other things, but you could alternatively say that people are forced to spend more on other things and that what changes as a result is not the incidence of poverty but the quality of the experience: for example, perhaps, that the typical experience of poverty has changed from perhaps having adequate shelter but not having adequate food to perhaps having adequate food but not having adequate shelter. but I’m not seeing the connection because, as far as I can make out, people spending less money on food is consistent with any of the three possibilities: poverty up, poverty down, or poverty steady. The relevance is simply in how the poverty line was originally defined. As being three times a basic but nutritious food budget at the time. This has since been upgraded for *general* inflation. But not for *food* inflation. If we did the same calculation today, three times a basic but nutritional food budget then the poverty line would be very much lower, perhaps 50% lower, than it is today. I am not, by the way, recommending that we do that. It is simply an interesting point to note. That if we started out again with the same definition we’d end up with a very different poverty line. This all depends upon how you define poverty. If it’s in market incomes and using relative poverty (less than x% of median income) then it wouldn’t surprise me at all to find that poverty hasn’t changed an inch in the US. I don’t know the answer but that one wouldn’t surprise me. If we define poverty as being some absolute standard of living then obviously poverty has fallen over that time span. Simple economic growth (at just about any level of inequality) will do that. And my basic point here is not in fact about poverty. It’s about the effect of poverty alleviation efforts upon it. JQ stated that goods and services in kind do not change the picture. Yet goods and services in kind appear to halve, near enough, the reported poverty rate. I regard that as being something of a change in the basic story. That really is the point I’m trying to get across and only that point. Good point – if you are in prison are you counted as being below the poverty line? Giving blind people guides dogs does not mean there are less people. Giving poverty-stricken families welfare does not mean there is less poverty. Giving blind people guides dogs does not mean there are less blind people. Poverty is not having enough money to get stuff. Getting stuff, or money to get stuff with, therefore reduces poverty. If you really think that welfare doesn’t reduce poverty then there’s no point at all in having any welfare, is there? Sweden, Denmark, everyone, can just give up right now. Yes, if you really want to reduce poverty – you should not provide welfare. You must provide jobs for wages producing things that the community needs. welfare does not reduce poverty – it institutionalises it. You only provide welfare when you have failed to include these people in the economy. A classic problem of capitalism. Good to see you could not rebut any of the numbers. Why would he bother? It’s the Heritage Foundation. Do you have any credible sources? @Jim Rose Nothing to rebut. Their data is from DOE Household energy consumption survey that has 40 years of data. Did they misquote it?